a piece on an 8” x 8” wrapped canvas, and these will be displayed in a grid as one large body of work. Each artist has been given complete freedom to create a work of their own chosen subject and in their own medium. Printmaker and ceramic artist Mark Herrling has created a 3D piece called “Star System” using stoneware, metallic acrylics and horse shoe nails. Painter Liz Quebe offers “Five Below”, one of her signature cows wreathed in an icy cloud of breath. Photographer Jerry Quebe offers an image of a drift fence buffeted by winter snow. 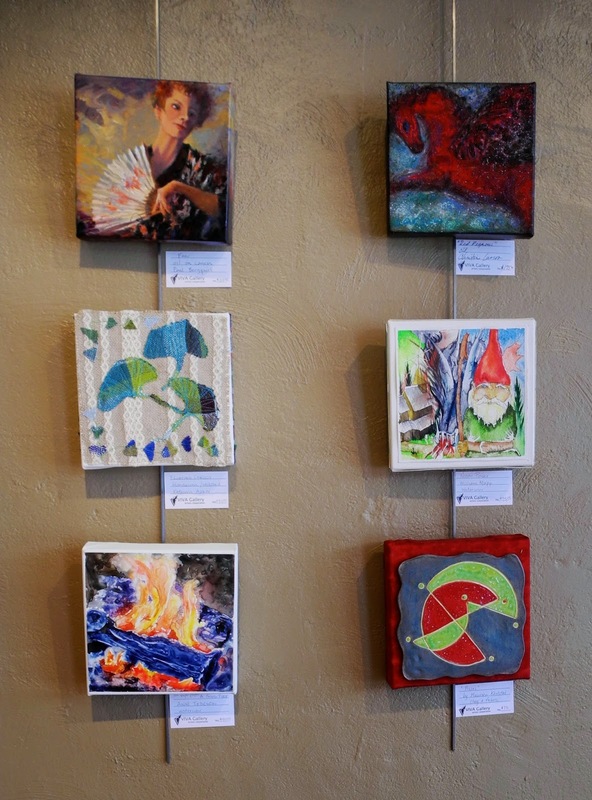 Jeweler and glass artist M’lou Wilkie will have a glass and tile mosaic on display, and Diane Dahl’s assemblage, “Layered Landscape” is a collage composed of copper mesh, beads and fiber overlaid on a photograph taken at the Neceda Wildlife Refuge. Daniel Gilbertson has applied a tooled leather piece of climbing roses on a lattice filigree to the canvas, while weaver Angela Feltes will incorporate fiber into one of her photographs that has been transferred onto the canvas. Painter Anne Tedeschi has chosen a warm subject, a watercolor of a crackling log fire, and Christine Larson’s vibrant red Pegasus is a sure antidote to January cold.